Richard Hoagland: Phobos is artificial! this time about Mars`s satellite, claiming that Phobos is artificial. we can see a quite real possibility of what can be a PROOF. Enjoy the trip with Hoagland`s mastery. Re: Richard Hoagland: Phobos is artificial! 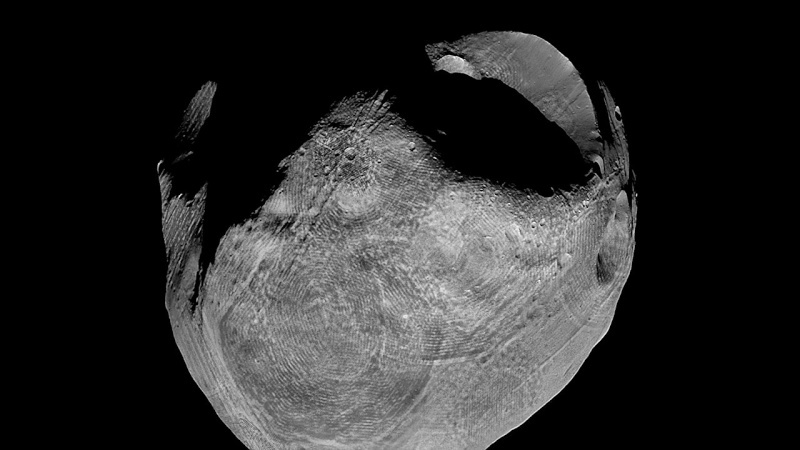 taken form http://webservices.esa.int/blog/post/7/1082 is, that no conclusion can be drawn from it regarding Phobos' internal structure, since in that radio band (4 MHz) the scan would have to be 3D, which it obviously isn't. The graph doesn't proof anything, since it a) doesn't include an irradiation angle b) doesn't include absolute - or any for that matter - targeting co-ordinates c) isn't a 3D scan, where interferences might point to cavities. He goes on to say that for conclusive results either exact orbit parameters measurement and/or 2 seismic probes scan would be required. As much as I hate to do it, I call BS on this one for the time being. At least until Richard Hoagland or ESA comes up with more conclusive data sets. Now I ask You Friends ? Does this Moon look anything like a Natural Object. BTW - Besides this Unnatural look to It - It ALSO moves in an Orbit reversed, or against the Orbit of Mars. "Let They Who hath Eyes to See - See..."
Mercuriel wrote: Does this Moon look anything like a Natural Object. You mean as compared to other natural objects and asteroids of this kind, of which we have plenty of similar photographic documentation? (^__~ ) Would you please elaborate what this is a proof of? While I agree that regarding Phobos there are many anomalies which beg further investigation, my point was that Richard Hoagland's current findings on the subject prove exactly nothing at all, besides wishful thinking, if not sensationalism. Uhhhmmm - I thought the Title of It was pretty plain. Mercuriel wrote: I didn't realize Your Agenda was to debunk Hoagland. Erm .. let me see ... Agenda? Oh well. Until now I didn't even realize I had an Agenda, but now that you mention it, I might as well get one I guess. BTW perhaps the Title is too plain? I don`t think you have some kind of agenda, since debunking of Richard Hoagland would not work. Of course, I understand it is very difficult to prove, in this moment, that Phobos is artificial. What is most important is that Richard shows us some details and, as it is said, "anomalies", that are making us to think different ways and to be open for POSSIBILITIES. I may agree that there are not obvious proofs that Phobos is artificial, but can you show me some proofs that IT IS NOT? Oliver wrote: I may agree that there are not obvious proofs that Phobos is artificial, but can you show me some proofs that IT IS NOT? Indeed I can't - neither I can provide a proof of any other celestial body not being artificial. Then again, this depends on the definition of artificiality. Since I believe all perceived reality is a result of intelligent plan, everything must be artificial in a way. Right? Actually I wasn't out to debunk anything - I was hoping for a positive result through independent assesment of that particular radar data. I find it a bit sad that so many people buy into whatever is given to them, pretty much the same way it happens in mainstream media, with so little discernment; I've been guilty of the same myself on too many counts after all. Now I do believe Phobos is very likely to be either artificial or bear evidence of an ET presence, but than again, what does belief has to with it? Mars and its two moons is the only other planet mankind in its current iteration has been in such intimate contact with, at least publicly, so we have little if anything to compare with to be able to say what is or isn't natural out there in space. That includes Phobos' orbit, the interesting patterns on its surface, the hints about its internal structure, and pretty much anything else. Most of our knowledge about space is based on observations and measurements from our limited instruments, the rest is more or less conclusions based on extrapolation, plus some obvious bias and politics in the official science. A bit like trying to determine planets' orbits solely according to Newtonian physics rather than relativity, which by the way we now also know not to provide a complete picture, if not being completely misleading. But, at least for me, plugging in wishful thinking doesn't quite work either. For me the most compelling evidence of stuff out there has actually been the obvious cover-ups, such as airbrushed Mars photos. I'm just still waiting for hard evidence, which unfortunately Hoagland's conclusion isn't. That doesn't mean such evidence isn't just around the corner. And I couldn't care less where or whom it comes from, as long as it is hard evidence. But I'm happy there are places such as this forum where such matters may be freely discussed and all points of view expressed. A new adventure. Hoagland's report about the diamond shaped asteroid "2867 Steins"
haibane wrote: Erm .. let me see ... Agenda? Oh well. Until now I didn't even realize I had an Agenda, but now that you mention it, I might as well get one I guess. Like I said - Sorry for entering Your Thread as I'm a bit confused as to just what You ARE discussing/doing/talking about in here and so I'll now leave You to carry on - Unimpeded by My Posts. As it was never My intention to get in an Arguement with You or anyone else for that matter - But merely to try and agree - I will leave You to find those of Like-Mind and trouble You no more about this. Mel from Veritas is going to interview Richard Hoagland in his show...why don't you write to Mel with some questions to ask Hoagland? No not at all - Its just that I came in thinking the wrong thing about Your Thread so I wanted You to know I was off base about why I came in here and that I didn't want to take You off-topic. Once I get My Laptop back from the Shop in a Month or so when I travel down - I'll post another couple of Images I've got of Saturn and some Anomalies and I don't mean the Hexagon - Which is Wild in its own right as an Issue of WTF. I actually attended this conference in 2009 with Greer, Wilcock and Hoagland and some other known names. If you haven't already seen this lecture, it's worth the time.. There is a piloted craft/comet in my underpants. I expect it to cause some earthquakes after dinner. Floyd wrote: There is a piloted craft/comet in my underpants. Maybe it's been too rainy in the UK Floyd, you're welcome to come to Florida for a little "sunshine"..
Its actually sunny here today for once. Thanks for the invite though! Well at least it's not sink holes. Richard C Hoagland presented "The REAL Story of Elenin ... NASA's Astonishing Visit to Vesta ... and the Secret Space Program" at the 3rd Annual British Exopolitics Expo at the University of Leeds. Who knows who whispers in Richard's ear?! One individual told me they like me on Phobos -- but that the Jesuits hate me!! Another individual told me I had friends in high places!! How might I interpret that?! I've actually had quite enough of this sort of thing. I think I might like to rejoin the chase in a few years -- but then again, perhaps not. Someday I might like to visit "Our Moon", Phobos, and 243 Ida -- or at least the ISS. On the other hand, the price of admission might be quite steep (including selling one's soul to you know who?). Is it really that far-fetched to think that Earth, the Moon, Mars, Several Moons, and Numerous Asteroids have Internal-Bases, Tunnels, and Trains?? I'd actually be quite surprised if this weren't the case. I think I might just read my Bible and a bunch of Science-Fiction Novels.